The ISTE Conference is like attending a Super Bowl, the event is larger than life, and you never know who you will meet. Billed as a conference for technology educators, the focus of ISTE-2013 was on the learner, while, to me, the prevailing themes of ISTE-2014 was the connected learner, and personal learning. Atlanta was a welcoming and accommodating host for the 16,000+ enthusiastic educators. As a proponent of life-wide learning, I make an effort to draw deeper meaning and understanding from everyday activities and adventures. Learning is happening all of the time. It's just a matter of choosing to recognize, process, reflect upon, and share our experiences. I'm not familiar with the literary work of Zadie Smith, but this quote shared recently on Twitter struck a chord with me. And so it goes for me, my life has seemingly turned into a series of Seinfeld episodes. The seemingly mundane and ordinary occurrences become fuel for observations, notations, and written reflections. Many times inquiry takes over and I twist experiences into questions that need answering. Thank goodness I have Google and my PLN as learning partners! I have read several terrific posts describing the ISTE experience and related takeaways. I will try to avoid redundancy by sharing a few original ISTE-2014 observations that merited lucid thought, and written notation that hopefully feeds further discussion and learning. I was not the first kid on the block to get a smart phone, but today I'm not sure that I could function normally without one. A social lifeline, an information conduit, and entertainment portal, my iPhone was used almost constantly during my journey from ORD to ATL. Travel alerts, weather updates, and paperless check-in; convenient and green! And while we're on the topic of mobile technology, the ISTE-2014 mobile app made navigation, organization, and interaction easy as pie. My compliments to the creators of the ISTE conference app! Props to the Atlanta public transportation system. I was pleasantly surprised that I could take the yellow line from the airport to the doorstep of the Hyatt for $3.00. The walk to the World Congress Center took about twenty minutes, but the air-conditioned shuttle buses cut that time in half. Bus #7 was a welcome sight after a long day of trudging around the convention center. Additionally, we had a small group that consistently rode the returning bus back to Peachtree Place. Together we discussed what we had seen and heard during the day. We called ourselves the "Lucky Sevens". Back at the convention center, I spotted Tom Whitby's Hawaiian shirt and prominent mustache from two escalators away. It was great sitting and chatting with him. We were trying to determine how many ISTE attendees were truly connected educators. We agreed whatever the percentage is, that we hope it grows to 100 percent someday soon. Tom and I have met facc-to-face twice, but we stay connected and engaged s learners through our writing. His blog, My Island View, ranks first in my RSS list. Be on the lookout for Tom's book later this year. I walked past Angela Maier's table at the Blogger's Cafe three times before I got up the nerve to stop and introduce myself. My loss because she immediately made me feel like the most important person in Atlanta. Well, at least until George Couros arrived and stole the spotlight by introducing his fiance'e while initiating a spontaneous "selfie" workshop. Oh yea, then Adam Bellow and Tom Murray appeared to discuss their latest thoughts on revolutionizing education. My importance level was dropping like the stock market in December. Actually, a nicer, more welcoming group of people you will never meet. It was highlight for me to be able to hang out with these influential educators, even if it was only for a few minutes. Fresh from my conversations at the Blogger's Cafe, I decided it was time for a cool and tasty peach-pop. On the way to the convention center lobby, I see Jimmy Casas, Eric Sheninger, and Tom Murray standing together talking. Feeling brave, I jumped right in by introducing myself and saying what a pleasure it was to meet all of them together. I then told Mr. Sheninger that he seemed shorter in person than he appears on his book. That's the way to make friends, right? But, he laughed it off and told me everyone says that when they meet him in person for the first time. Once again, it was great sharing a few laughs with respected educators who I also consider PLN friends. One of my most significant learning experiences occurred while having dinner at Ted's Montana Grill. Phil and I were sitting at the window counter each of us dining alone. He was an older gentleman wearing tattoos and riding boots. I mistakenly assumed his "hog" was parked around the corner. Phil was actually an over-the-road truck driver for Upstaging, and he was currently on tour with Rebelution, and next week, Miranda Lambert. I guess I was feeling a little road weary from attending two conferences in a week when Phil told me he had been home a total of eleven days in the past year. Phil's home and family were in southwest Texas. He shared some great stories about life on the highway. He also stared down at his plate as he described how his kids had grown up without him around, and how his grand children call him by his first name. We watched the concert goers walk by, we talked about classic country music, and we shared a few laughs. I paid for his burger and he left a generous tip. We may never see each other again, but we became instant friends. Phil's not a professional educator, but I learned quite a bit from him as he shared his stories. In addition to learning with members of my PLN, I also attended several interesting workshops, poster sessions, and round-table discussions. Leigh Zeitz helped me understand the difference between standards indexing and standards referencing when building professional digital portfolios. I found ISTE-2014 to be an enjoyable and enriching experience. I learned some new things, made some new friends, and laughed with old friends. It also felt good to contribute to the learning of others face-to-face, and through social media. Community, connectedness, and personal learning; those are my takeaways from this enjoyable trip. This was my 2nd ISTE conference. I hope to see everyone in Philadelphia next year! 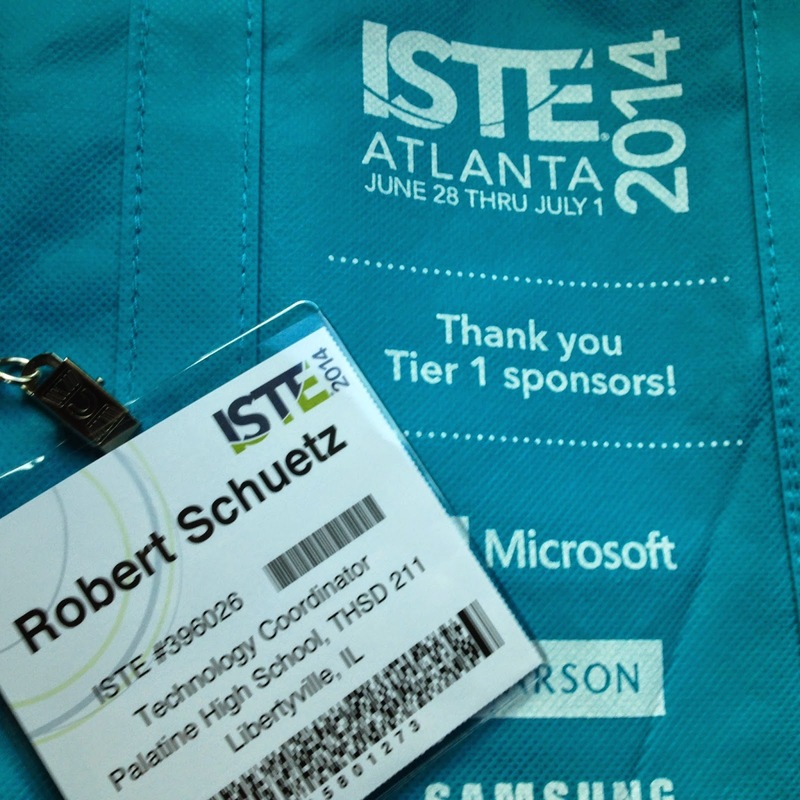 Whether you attended physically or virtually, what are your takeaways from ISTE-2014?